Garden cleanup, lawn mowing and falling leaves all provide materials that make autumn a good time of year for composting. No need for exotic ingredients, fancy equipment or a degree in soil microbiology to put together a pile that yields quality compost and is not unpleasantly aromatic. You might look upon your compost pile as a pet, a conglomeration of millions of beneficial fungi, bacteria and other soil microorganisms. The pet benefits from the right housing. 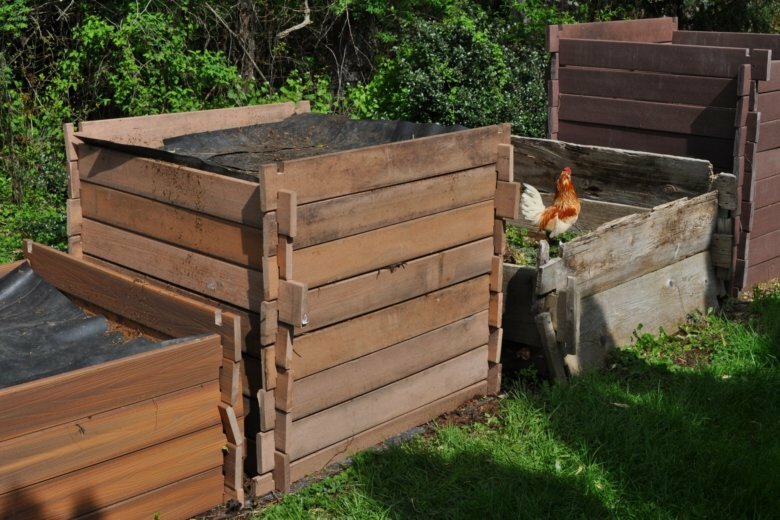 So one item that can greatly improve your compost-making is some sort of enclosure — a compost bin. A bin can fend off raccoons and stray dogs, as well as retain moisture and heat generated by the hard-working compost microorganisms. The latter is especially important as outdoor temperatures cool. And if nothing more, a compost bin keeps a compost pile from looking like a garbage pile. Whether you purchase a bin or make one yourself, 9 cubic feet is the minimum size for a critical mass to generate and maintain heat. My homemade “state of the art” compost bin was originally constructed from 1-by-12-inch wooden boards, 5 feet long and notched near their ends so that they could be stacked together like Lincoln Logs. Nowadays, I use 1-by-6-inch “manufactured wood” (such as Moistureshield, Azek or Correctdeck), which should last many, many years. The boards are about 4 feet long and, as before, have notches cut into them so they can stack. A bin is a minimum requirement for good compost; compost mavens will set up two or more bins. This allows ingredients in one bin to age and mellow while materials are being added to a second bin. If you become even more enthusiastic about composting, you might lavish more attention on the mix of ingredients. The two most important foodstuffs of composting microorganisms are carbon and nitrogen. Old, usually brown and dry plant materials, such as autumn leaves, straw and sawdust, are rich in carbon. The older the plant material, the richer it is in carbon. Nitrogen-rich materials include succulent, green plant parts, such as tomato stalks; vegetable waste from the kitchen; and grass clippings, as well as manures. Especially concentrated sources of nitrogen include nitrogen fertilizers and seed meals. Soybean meal (available at feed stores) is my favorite high-nitrogen feed. Fuel your compost with a mix of nitrogen-rich and carbon-rich materials. How much of each to add will vary with their composition and particle size, but let observation and experience be your guides. A long-probed compost thermometer and your nose are good monitoring devices. If your pile never heats up — and temperatures above 130 degrees are not uncommon — it could be due to an excess of carbon, weather that’s too cold, or materials added gradually over a long a period of time. Offensive smells and the presence of flies might indicate the opposite problem — too much nitrogen. Attention to water is the next level of care you might lavish on your compost pile. Too little water results in little or no activity, another reason why a pile may not heat up. Too much water drives out air and results in offensive smells. You could do even more for your pile. You could chop the ingredients. You could stir the whole mass up and rebuild the pile after a few weeks or months. If all this messing around seems like too much effort, don’t do it all. A casually made pile may not generate as much heat or finish up as fast as one deliberately assembled, but time has much the same effect on compost quality as does heat. Either way, any pile of living or once living ingredients eventually becomes compost, recognizable as a dark brown, crumbly fudge with a woodsy smell. Do pile those raw materials into some sort of compost bin, though.